Stop the Shots! - Are Vaccinations Killing Our Pets? Buy any Amazon book here! Most pets today are being given too many vaccinations too often. Many caretakers are unaware of the known risks inherent in vaccines. Studies upon studies have been performed that show the very real dangers in over-vaccinating and the risks involved every time a pet gets a shot. But the word is not getting out. Dogs and cats continue to be over-vaccinated, resulting in compromised immune systems, serious diseases and (more often than you might imagine) death. John Clifton, pet advocate and award-finalist author, thoroughly researched the topic, devoting a year to this single subject. He was amazed to find that all the major animal health organizations – such as the American Veterinary Medical Association, the American Animal Hospital Association and the American Association of Feline Practitioners – have recently issued guidelines emphasizing the need to minimize rather than maximize vaccines. The risks range from simple allergies to cancer to terminal shock. But most veterinarians are not following the guidelines of their own professional literature! Mr. Clifton's stated mission is to spread the word to every pet owner in the hopes of preserving the health and saving the lives of our beloved animal companions. This is not a marginal issue. A search on Google for pet vaccination dangers will return tens of thousands of links on this topic. Here is a sample site, written by veterinarians. So many devoted pet lovers, believing they are dutifully doing the very best for their pets, discover the truth too late. They're devastated to learn that giving all those unnecessary vaccines ("just to be safe!") and annual "booster" shots has resulted in tragedy. The result of Mr. Clifton's work, and the work of countless researchers, is encapsulated in this little volume – very easily read and understood by all. It is not an "anti-vaccine" book, but a balanced look at the facts. Once armed with the information in this book, you can make the best decisions for yourself and your pet. We urge you to read this book as soon as possible – certainly before your next vaccination appointment with your veterinarian. both the pros and cons of vaccinating"
Now - also available as an E-BOOK! Vaccines do NOT improve the immune system. Annual "booster shots" are a BAD idea. Many breeders choose NO VACCINATIONS! Many blame pet ALLERGIES on shots. "Finally, a book I can wholeheartedly recommend to every person who loves animals and wants to do the best they can to keep their companions, patients, and customers healthy for many long years. John Clifton's book is articulate, easy to read, accurate, well organized, current and full of love. Your animals are begging you to buy, read and implement this book - TODAY. In my 30 years of holistic practice and lecturing to thousands of veterinarians and animal guardians I can say categorically that vaccines have caused extensive long term harm and animal suffering for susceptible animals. I applaud the conventional researchers recommendations for fewer vaccines and encourage everyone to give very few to no vaccines. — well-researched and balanced. I sincerely hope that the general public can easily access this book, as it very well may SAVE THEIR PET'S LIFE. . .An important volume, one that was sorely needed in the pet community"
"STOP THE SHOTS - Interview with John Clifton"
"If it were a magazine article, it would be one of the most important on health you'd ever want to clip, save, and pin to the fridge with magnets. " ...Clifton makes it simple for the rest of us, providing such important information as how vaccines work, the difference between "live virus" and "killed" vaccines, an explanation of titers, and why only vets — NOT pet-shop personnel — should administer inoculations. Clifton is not opposed to all vaccinations; his goal, he writes, is not to turn readers against their vets, but to be their pets' first line of defense against potentially fatal over-vaccination. 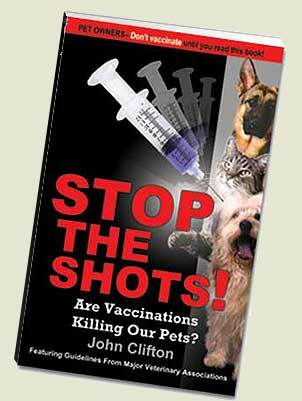 The book is short and easy to read, from its large typeface to its concise, clearly-outlined chapters... "
Award-finalist author and pet lover John Clifton logically and rationally argues against so-called conventional wisdom, such as vaccinating against diseases that pets will never be exposed to...or the use of annual booster shots. Chapters discuss how vaccines work, the health detriments to over-vaccination such as increased risk of pet cancer or curtailment of the pet's immune system's ability to naturally fight off diseases, factors to keep in mind when deciding when the proper time is for a booster shot, and much more." "Mr. Clifton does a really good job of presenting the facts in an easy-to-read book that is also easy for any pet owner to comprehend. I hope all pet owners read this book and then take a copy to their veterinarian." — Gary VanEngelenburg, DVM, TV's popular "Dr. Van"
"This book is a MUST read! I had the pleasure of being a vet tech for seven years under an "old school" veterinarian who NEVER PUSHED UNNEEDED VACCINES. Unfortunately, when he retired I was left to work for his two "new school" colleagues who pushed vaccines, experimental medications/anesthetics, used brute force instead of psychology. I was in the front line when injection-site sarcomas were being tracked by the AAHA (right rear rabies! )...I've seen animals "crash" after vaccines (especially cats and ferrets). I've also seen how "old" vets treated vaccines (prevention) and how "new" vets now treat vaccines ($$- it's a business). Sad. Very Sad. READ THIS BOOK...while it's not a pedagogical text on immunology and vaccines, it is an easy read for the non-technical that has a great reference section and will provide the caring pet owner with food for thought." "I am more than impressed!!! Clifton successfully and gently guides the reader through the intricacies of the process of vaccination while at the same time conveying an easily understood "picture" of the natural power that is the immune system. Through it all he somehow still keeps this complex topic easy to follow for the pet owner. In terms and analogies that are both effective, and CORRECT, he encourages the reader to venture outside the proverbial box. His message is clear, concise and fact based. This is the handy little book we breeders have been longing for and will be adding to our puppy buyers' required reading list. I urge everyone here to order their copy today. This book is a must have in any pet lover's home library." - all you need to know about vaccinating and NOT vaccinating your pet. - how to tailor a plan for YOUR pet. - what LEADING VETERINARY ORGANIZATIONS are saying about pet vaccination dangers. - what your veterinarian may NOT tell you! Beagle breeder who is having problems with shots and reactions. Just need to know more. Tell the world! Great subject! I recently found out from our vet that their office is restructuring their vaccine recommendations due to recent new information. Thrilled that such a book will come into print! Will you be supplying books to retailers as I would be interested in selling these on my website. Many thanks Very anxious to read this book. I feel a great need to educate my puppy buyers and I am having a hard time doing it. I am very interested in getting your book. Please let me know whenit is available. I hope I can get it via Amazon.ca or Chapters.ca I only started learning all the info I can about vaccinations a few months ago, but I think the more info out there for us the better. I am looking forward to the book coming out. I have lost too many animal at a young age, thinking some may be connected to vacs. I will vac no more. Came from JSNTV........the more we know the more we can send forward to others, by word or example. I'm expecting a litter of Goldens any day now so I want to wait until they arrive - I'm going to order a book to go home with each one. I recently lost of golden of my breeding, would have been 3 in Dec, to vaccine induced sarcoma that spread to his lungs - this was the diagnosis of 3 different vets so at least these 3 vets were willing to acknowledge it. Let me know when available. Yeah! Thank you for writting this book saw this on the Just say no to (pet) vax list Does it explain how to get around City Ordinances regarding Rabies shots for Dogs that live within city limits? Recently lost my beloved dog to bone cancer. Over vaccination contributed, I believe. Too late smart about the dangers of vacinations. Thanks for writing your book. Good to pass along this important info. I have a new puppy so am interested in this book. interesting book Can't wait I do not vaccinate my dogs and I do my bests to educate other pet owners. This book will help. Thanks for doing it. Please advise where it is available and for how much. I'd love to read this book! Please let me know when its available on Amazon.com! I hope that more vets are open to this idea! LOOKING FORWARD TO IT. thanks Please email me when this book becomes available. Thanks! wonderful idea Can't wait for the book. 6.5 year old terv "BONE CANCER" 3 months after receiving 3 year rabies shot. I question the shot. I look forward to reading this book. I have three scottish terriers. One has never been vaxed, one has had only one, and the last is a rescue who was probably vaxed twice with the works in the range of 8 mos. I have not vaxed any of mine once they are in my home. located in Canada, will book be distributed there as well? Will there be a discount for breeders that buy multiple copies? Please let me know when your book will be out. I would like to carry it in my store. If only I would of known this 7yrs ago, when I got my first GSD! They have now been vax free for 4yrs, but unfortunately, the damage has been done!The price they had to pay is; puppy mange, pano, allergies, pannus,and fear issues. Yes.. I feel they are all from the vax's they received. Now I try to inform anyone I know.. that doesn't know. Anxiously waiting for your book to come out.. great Christmas gifts! Thank You! Thank you so much for writing this book! The info is out there but people need LOUD reminders. The more the info is out, the more people will question, the less vets will be able to ignore and fewer pets will be subjected to unnecessary vaccinations. As a stud owner who does not vaccinate I am interested in providing your book to all new puppy owners! I have two Bedlington Terriers who have had mammary tumors removed (in fact everything including the ovary) and who are doing very well at the moment. Being 10 and 7 years old I stopped vaccinating them 3 years ago and have no intention to do it again. I have titer tested them and although the parvo was a bit low, I believe they are sufficiently protected since the immune system isn't on the alert all the time. Here in Norway it is impossible to get separate shots (except rabies, which we don't have and few owners vaccinate against unless they take their dogs abroad, for then it is compulsory). My vet has asked the ministry in charge about why she isn't allowed to import single vaccine shots, but gets no sane reply. It's somehow simpler to give 4 vaccines in the same shot even if anybody with common sense would understand that this is four times more hazardous than giving each vaccine separately.